Diet food. Two words that make me shudder. I’ve always thought it better to take an extra walk or run an extra mile rather than give up the things I love to eat. I guess it’s good that I don’t like junk food, ailment but a life without full-fat cheese and pasta is no life at all. Even so, I find myself heavier than I’d like 6 weeks after pregnancy. I guess a pint or two of Ben & Jerry’s a week for 9 months will do that to you. So, it’s time to buckle down and diet. For me, that means more vegetables and more workouts, but no less flavor. Set a large pot over medium heat. Once it’s hot, heat the olive oil then add the onions and cook for 7 minutes, or until they begin to brown a bit. Add the garlic and cook for a minute, then add the carrots and tomatoes. Continue cooking for about 5 minutes, then add the chicken stock and simmer for about 25 minutes, or until the carrots are tender. Using an immersion blender, blender or food processor, puree the soup until no large pieces of carrots or tomatoes remain. Return to the pot. Add the lemon juice, salt, pepper, paprika and saffron and continue cooking for another 10 minutes. Taste and adjust the seasoning as needed. While the soup is cooking, set a large skillet over medium heat and cook the bacon. When the bacon is beginning to turn brown, add the torn bread and cook until golden. Remove with a slotted spatula to a paper towel. 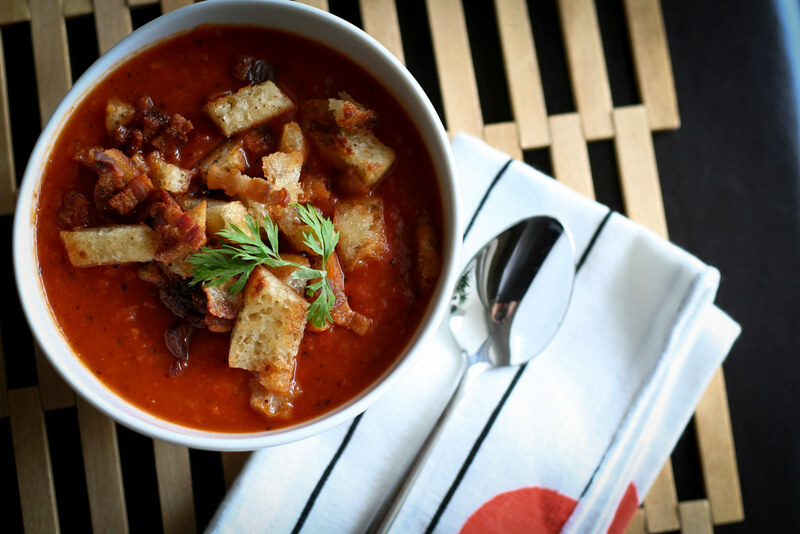 Ladle the soup into bowls and top with a heap of bacon croutons. Awesome! 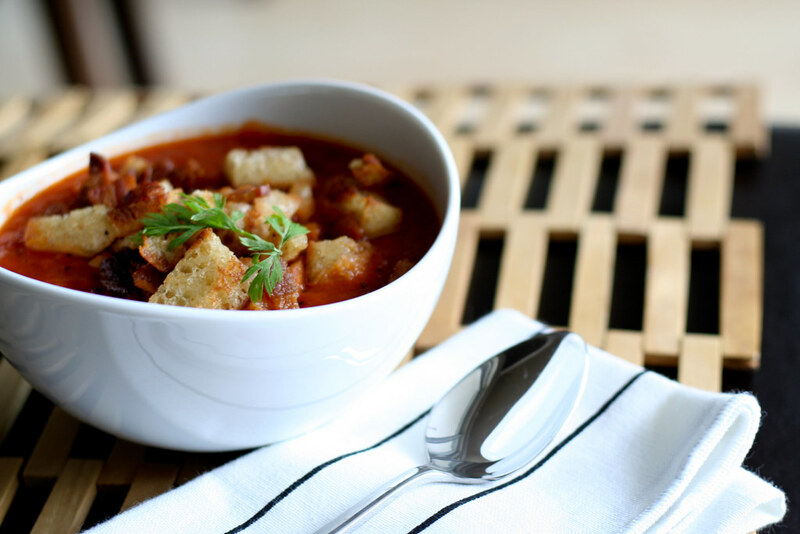 I love tomatoes and now that tomatoes are in season here, I will make this receipe for sure. I just wanted to let you know that I did a write up on your AWESOME site today! Seriously, keep it up…love your blog and your pics are AMAZING! I’m a 7th gen Floridian (living in Austin, Texas) and also going to be a Mom to a lil’ boy in late November! So just wanted to say HOWDY and tell you how much I can’t wait to try some of your recipes! Hugs!